It’s interesting that some of the main themes of David Mitchell‘s The thousand autumns of Jacob de Zoet are conveyed by one of its lesser (in terms of status) and more questionable (in terms of morality) characters, the Dutch cook, Arie Grote. Interesting because such a slippery and relatively minor character expresses some critical themes and because Mitchell’s making this choice provides a clue to the book’s tone and style. It has, in other words, a rather wry undertone. So, what is its plot? Broadly, it is about the Dutch East India Company‘s activities on Dejima, a walled island in Nagasaki harbour, during Japan’s isolationist (or, “Cloistered Empire”) period, with most of the action taking place between 1799 and 1800. It follows Jacob de Zoet, a young man who arrives in 1799 to work as a clerk (and to make his fortune so he can return home to marry his love, Anna). What he finds is a multicultural community comprising Dutch, Japanese, a Prussian, an Irishman and others including Malay slaves, living and working within a complex web of ambitions, animosities and allegiances. He discovers pretty quickly that he’s going to need good survival skills to make it through. The question is: will he make it through, and will he do it with his integrity intact? There is a love triangle of sorts, involving a young Japanese midwife named Orito. And there’s a drama centred on her “abduction” to a horrifying (invoking, for me, Margaret Atwood‘s The handmaid’s tale) monastery/nunnery called Mt Shiranui, which is overseen by the evil lord/abbot, Enomoto. This sounds, I admit, a bit melodramatic and in a way it is, but it seems to work, largely because of the characterisation. The novel has a huge cast of characters, as this Character List (source unknown) shows and, over the course of 450+ pages, Mitchell gives us the backstories to many of them. At times I felt there was too much detail – as in “why do I need to know all this?” – but the stories were so interesting that I didn’t really mind. Mitchell is not, I have to say, a taker-outer and so, if you like your stories to move along at a fast clip, this is not for you. Many of the characters, from bottom to top of the hierarchy, are corrupt, as they scheme, bribe and manipulate for money, power and/or prestige, but not all are. Some of the most interesting characters are those who are not corrupt but are not perfect either. They include Jacob; the doctor/scientist, Dr Marinus, who tests Jacob somewhat cruelly; the young interpreter, Ogawa Uzaemon, who overlooks Jacob’s illegal importation of his Christian psalter; and John Penhaligon, the gout-ridden English captain who makes a play for Dejima late in the novel. a good deal of humour (including the scene in which a Japanese translator tries to translate a scientific lecture being given by Dr Marinus). The creeds of Enomoto’s order shine darkness on all things. … a black butterfly lands on the white stone, and unfolds its wings. I was impressed by the array of literary devices he used and how it never felt overdone. It was his language and characterisation, more than anything else, that kept me engaged. That’s a pretty broad church and, although some naturally overlap, the effect is to dilute the book’s impact somewhat. So, how would I encapsulate it? Well, I’d sum it up as being about “imprisonment”, both literal and metaphorical. The Dutch are imprisoned on Dejima, the Japanese are imprisoned within their self-imposed isolationist policy, Orito and her “sisters” are imprisoned at Mt Shiranui. And people are imprisoned by their roles and/or culture. For example, women’s options are restricted, slaves have little control over their lives, and many of the characters, including Jacob, are imprisoned by their lack of economic resources that would enable them to freely choose their lives. This is one of those rather unwieldy books that is hard to pin down but, despite this, I did rather enjoy watching Jacob and co. going about “the noble art of survivin'” in an intriguing place and time. It’s always nice to revist a book through your eyes. If interested, you can read a longish interview here at the Paris Review: http://www.theparisreview.org/interviews/6034/the-art-of-fiction-no-204-david-mitchell. Well, thanks Kevin (in Ca)! I never read reviews before I read books (I’m weird that way, I think), but I like to read reviews after – “real” reviews I mean rather than brief descriptive pieces. I will read it now. As for the book … two reasons why I got through it. 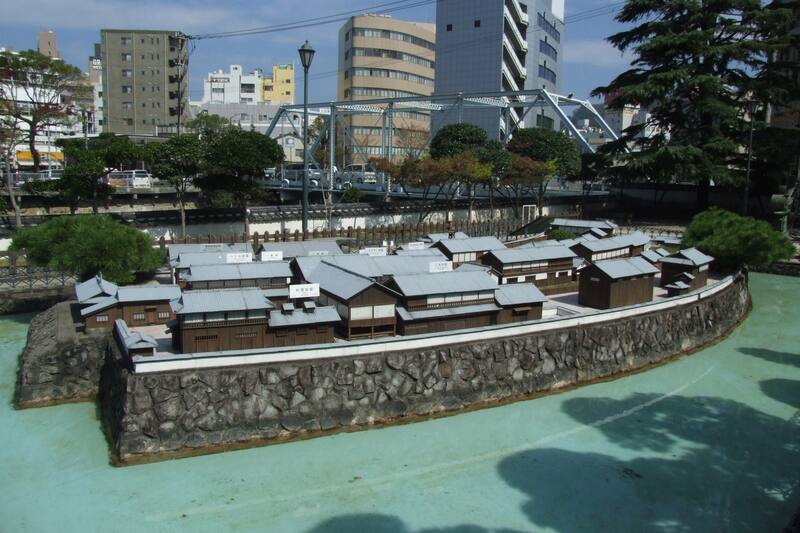 First is that we’ve been to Nagasaki and the Dejima site (hence the photo). Found Nagaski fascinating, and am interested in Japan in general. And second is that I did enjoy the language and trying to work out what he was doing/meant by it all. It did require some stamina to work one’s way through all those characters at the beginning. Sometimes in these situations I just decide to go with the flow and hope it will all fall into place eventually. It usually does! I can see though why it didn’t make the Booker shortlist. I do like the setting for this one but I am not sure that I want to give his writing style a go just yet. I think I need to read a couple of enthusiasticly raving reviews before I decide to read it. Hi Marg, nice to hear from you again. There is a very positive review by Lizzy Siddal: http://lizzysiddal.wordpress.com/2010/08/04/the-thousand-autumns-of-jacob-de-zoet-david-mitchell/ Also, I think if you go to the Complete Review site – you know that one – there are some very positive ones. I haven’t read them (yet) but they list reviews with ratings and I think there are at least a couple of ones rated A that might be worth checking out. HI Tony – but you haven’t reviewed it on your blog have you? I don’t see it there? Being a great fan of David Mitchell’s fiction, I read Thousand Autumns when it first came out and enjoyed it immensely. It is rather a harder read than his earlier books, but well worth the effort I thought. I am really taken with his ability to capture a scene or a mood, in an exquisite short sentence. Thanks Anne. What would you recommend to read next – given I’ve read Cloud atlas and this one? (Not that I’ll have time in the near future but I would like to read more). Aha! If I’d been a better daughter and had read this post this morning instead of tonight, I wouldn’t have had to ask you what the word for “a contradiction in terms” was this afternoon! LOL Hannah … I did think you would have known if you’d read your mother’s words of wisdom! I’ve heard good things about this book and have also read that it is his most conventionally written book. I’ve only read and loved Cloud Atlas. Almost picked this one up at the bookstore the other day but went for the paperback of A.S. Byatt’s Children’s Story instead. Well, EVERYONE seems to rave over the Byatt. I have it, but haven’t got to it yet. I’m like you, this is only my second Mitchell, and it was more conventional than I was expecting. Ghost Written is probably the most like Cloud Atlas, a series of different voices across continetnts and time, linked by the “ghost” of the title. Number9Dream is very much influenced by Murakami, very clever though and totally unpredictable. Hmm … thanks Anne. I love Murakami so maybe I should look out for Number9Dream. Lovely review Sue. He’s a fine writer, but this didn’t quite hit the mark for me. Looking forward to what he does next though. jb@LD! Thanks Dilettante! I can totally understand that. I must say I found it hard to write the review and have fiddled with it since I wrote it, and I think that’s because it does have its flaws but it did engage me – so, how to get that across? Sorry for such a late comment, but I just read your review of this the other day and really liked it, so I thought I should let you know. I liked how you brought out the complexity of themes and how that was at times a flaw. Nice stuff. That aside, the only one I’ve read so far is Ghostwritten which I’ve written up at mine. Kerry at Hungry has read several Mitchell’s and is really good on Mitchell if you’re looking for suggestions on where to go next still. A comment is always a comment whether early or late, so no apologies needed, Max. The nice thing is to get the feedback isn’t it – and I appreciate yours here. I’ll check out your Ghostwritten post, and also Kerry. Thanks for the heads up. Kerry really is good on Mitchell, time spent there definitely won’t be wasted (but then, time spent there never is). You’re right Max, it never is … as with your blog too. Like the too-kind Max, I am late to the party. But, I really enjoyed your take and the multiple themes and ideas you were able to bring out. I particularly like your “imprisonment” summation. It is not a bad summation of his work as a whole. As you know from Cloud Atlas, constraints on liberty whether philosophical, physical, or cultural are often the key points of his novels. Max is definitely correct that Ghostwritten is the closest in structure to Cloud Atlas. I would say number9dream is the closest in quality. But, to my aesthetic sense, he doesn’t have any duds. They are all good and, despite the umbrella theme of subjugation, they are each unique. It’s one of the things I like about Mitchell. I loved your take on the book. Max’s take on Ghostwritten is quite good. He has the sci-fi chops to really take it on. My own reading in the sci-fi genre is fairly limited, so cannot bring the same knowledge to those aspects of Mitchell’s writing that Max does. Thanks for an interesting review! Lovely response Kerry from someone’s whose review is splendiferous. I’m rather chuffed that you like my take. As we’ve both said, there’s a lot here to tease out isn’t there. I clearly need to read more Mitchell as I’ve only read the two. My sci-fi reading is pretty minimal too, I must say. To be honest WG, I wouldn’t particularly recommend reading SF unless it appealed to you anyway. Life’s too short to read stuff that doesn’t tempt, whatever its merits may be. OK, Max, I’ll take you at your word! I think I would like to read Atwood’s Oryx and Crake sometime. Have you read that? And would you call it SF, anyhow?